For more than six decades, South Korea has coped with one of the most enduring geopolitical asymmetries in the world, namely, the South-North conundrum on the Korean Peninsula. 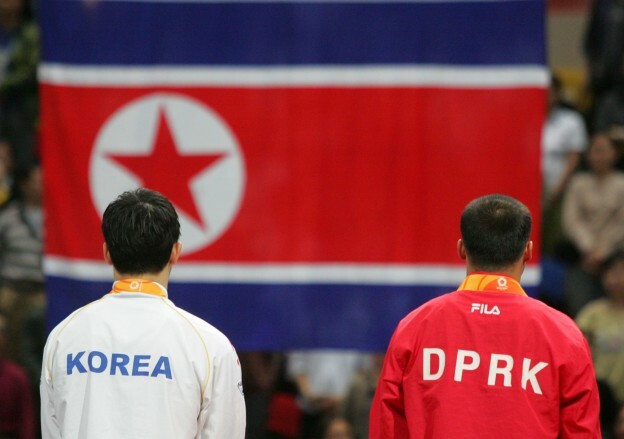 Virtually every aspect of Seoul’s policies and strategies towards Pyongyang is governed by this fundamental quandary that has resulted oftentimes in contrasting and even conflicting approaches and attendant policy objectives. Even a cursory description of the Korean Peninsula illustrates the stark polarization that exists between the South and the North, such as two states that share a common national heritage but are separated by fundamentally different ideologies; the world’s only communist dynasty lying next to Asia’s most vibrant democracy; a failed, planned economy and one of the poorest in Asia that stands in stark contrast to the world’s twelfth and Asia’s fourth largest economy; and a system where the state reigns supreme versus a system where state contestation is more common than ever before. On top of these imposing divides, South Korea has also to contend with six key factors that shape its policies to the North: First, managing and responding to a range of North Korean military threats, including Pyongyang’s nuclear weapons capabilities since its first nuclear test of 2006; second, the increasingly robust power projection capabilities of all of the great powers with key interests in Northeast Asia and attendant consequences for South Korean defense and, in the longer term, the defense requirements for a unified Korea; third, coping with an expanding spectrum of hybrid national security challenges, including accelerating cyberattacks, securing long-term energy supplies, and deepening maritime competition in the Indo-Pacific oceans; fourth, the growing politicization of the foreign policy making process, particularly as it relates to South-North relations; fifth, the expanding role of the parliament, political parties, the media, NGOs and even international public opinion in the conduct of South Korean foreign policy, including relations with the North; and sixth, despite all of the seemingly impossible and intractable roadblocks surrounding the two Koreas, the need for an enduring political settlement that could pave the way for peaceful reunification and the reattachment of the Korean nation. In an effort to understand such distinctive threads in South Korea’s overarching strategy towards the North, this article is divided into three main sections: First, understanding South Korea’s complex and contrasting worldviews as evinced by a series of opinion surveys that illustrates South Korea’s multifaceted and intricate perceptions of its much more powerful neighbors, Seoul’s core strategic interests including unification dynamics, and South Korea’s nuanced views on key national security choices; second, analyzing the primacy of the North Korean threat but also Seoul’s growing need to cope with a series of emerging security threats, such as networked terrorism and cyberattacks; and third, a cumulative review of South Korea’s current and projected approaches and constraints towards North Korea. Over the years, South Korea’s weltanschauung reflects all of the strands noted above through a series of juxtaposing perceptions. A series of polarized worldviews permeates Korea’s political psychology, such as an instinctive resentment against external dependence but equally relevant realization of the benefits accruing from a security umbrella; the struggle for independence in the face of much stronger powers but abiding concerns of strategic abandonment; and a self-identity harnessed by intense nationalism but tempered by benefits flowing from mutually reinforcing globalization. In a nutshell, Koreans have a healthy dose of mistrust of the great powers owing to centuries of upheavals wrought by invasions and colonization, but at the very same time, a keen sense of realpolitik honed over centuries of non-stop interaction. While such complex attributes cannot be accurately measured, opinion surveys serve as an important window that sheds light on some of the key manifestations of Korea’s multifaceted worldviews. For example, the Asan Institute for Policy Studies is unique in that it conducts daily polls on a range of topics related to South Korea’s foreign policies, including Seoul’s perceptions of the United States, China, Japan, and of course, North Korea with weekly analyses and breaking news polls in the aftermath of a major crisis such as Pyongyang’s third nuclear test in February 2013. 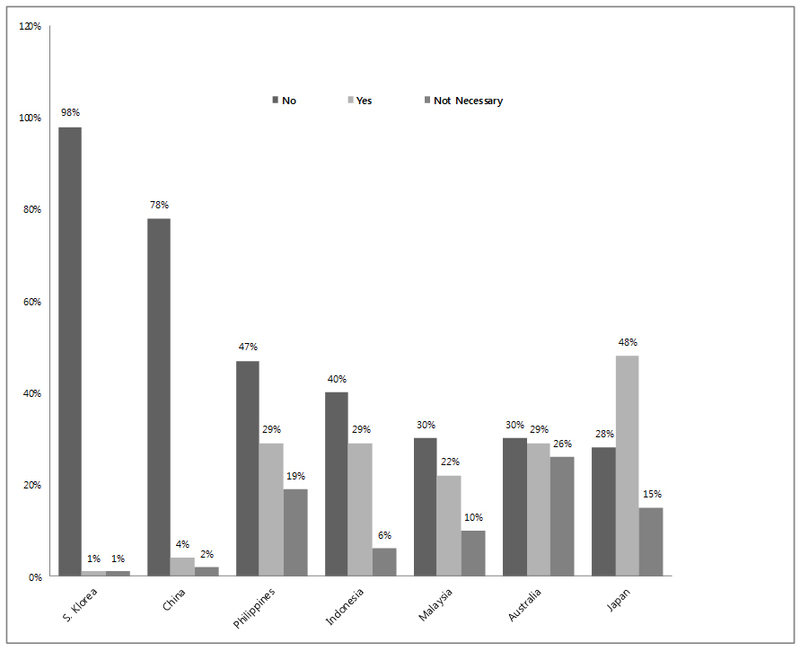 Source: “Summary Analysis of Asan Daily Poll on National Security, Assessment of Relations with the Neighboring Countries, and Accountability over the Breakdown in South-North Negotiations,” The Asan Institute for Policy Studies, June 1-30, 2013. Numbers have been rounded. 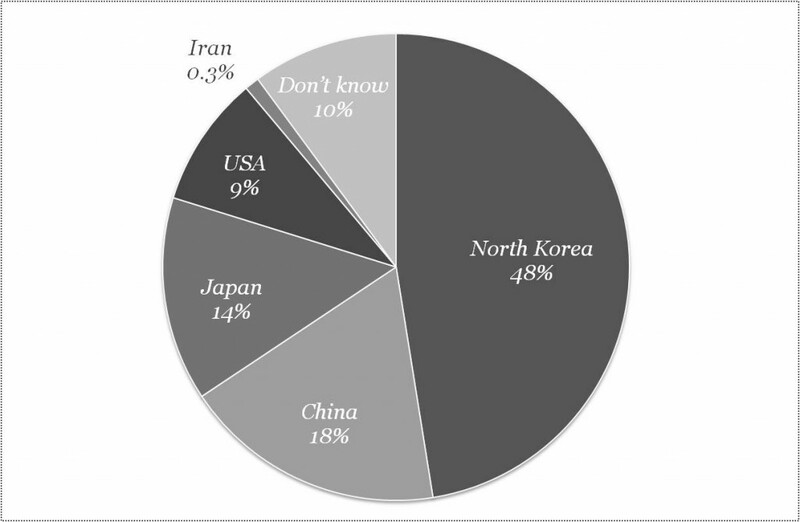 As illustrated in Graph 1, 56 percent of South Koreans had a favorable view of the United States followed by China (30%), Japan (14%) and North Korea (9%)1. 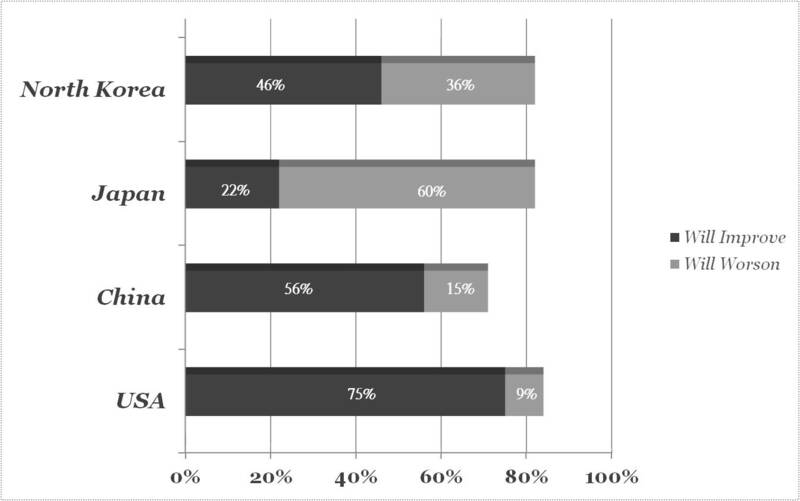 Contrary to conventional wisdom, however, what stands out is that an overwhelming majority of South Koreans in their 20s and 30s—arguably the most liberal population segment—(90% and 81%, respectively) had negative feelings towards North Korea, which were actually higher than negative attitudes towards Japan (74% and 80%, respectively). Attitudes towards Japan are not likely to change any time in the near future given the iron grip of history that continues to shape perceptions and, similarly, Japanese attitudes towards Koreans. According to a July 2013 Global Attitudes Project Pew Research poll on Japan’s regional perceptions, South Korea and China continue to register the highest negative attitudes towards Japan compared to other Asian countries. Both China and South Korea have the highest negative feelings about Japan compared to other Asian states and sentiments towards Japan have declined by 25 percent since 2008 and 17 percent in China since 2006 according to the Global Attitudes Project as can be seen in Graph 5 below.2 The bitter legacy of colonization, occupation, and wars is felt much more strongly than in other Asian states, but 48 percent of Japanese believe that Japan has sufficiently apologized for its military actions while 15 percent believe that there is no need to do so or that a majority of the Japanese believe that the war is behind them. 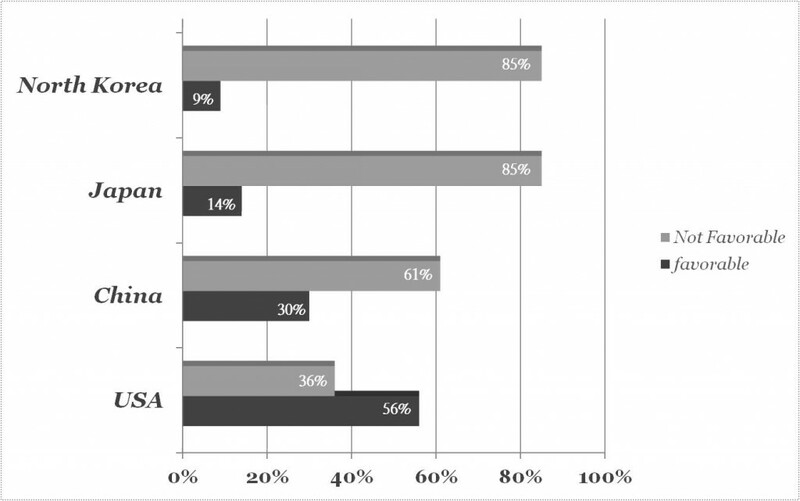 Younger Asians feel that Japan should continue to atone for its past; those that feel that Japan has either apologized enough or there is no need for one break down as follows: Koreans (3%), Chinese (4%), Indonesians (31%), and Malaysians (36%). Graph 6: Sufficient Japanese Apology? Source: “Japanese Public’s Mood Rebounding, Abe Highly Popular,” Pew Research Global Attitudes Project, Survey Report, July 11, 2013, http://www.pewglobal.org/2013/07/11/japanese-publics-mood-rebounding-abe-strongly-popular/. Numbers have been rounded. Even though perceptions of Japan are much more negative than prevailing attitudes towards China, Seoul’s views towards Beijing are hardly uniform or linear. Indeed, it could be argued that although attitudes towards Japan are much more visceral given deeply rooted sentiments of victimization, perceptions of China are more complicated and laced with pockets of deep anxiety. In a July 2013 Pew poll on global images of the United States and China, 78 percent of South Koreans had a favorable view of the United States while 46 percent had a favorable view of China.3 Among eight countries that were sampled for this—Australia, China, South Korea, Pakistan, Indonesia, Malaysia, Japan, and the Philippines—three countries had less than 50 percent favorable views of China: Japan (5%), South Korea (46%), and the Philippines (48%). Favorable views of the United States among its four allies—Japan, South Korea, Australia, and the Philippines—averaged 74 percent. Among these US allies Australia had the highest favorable rating of China (58%) and the lowest of the United States (66%). 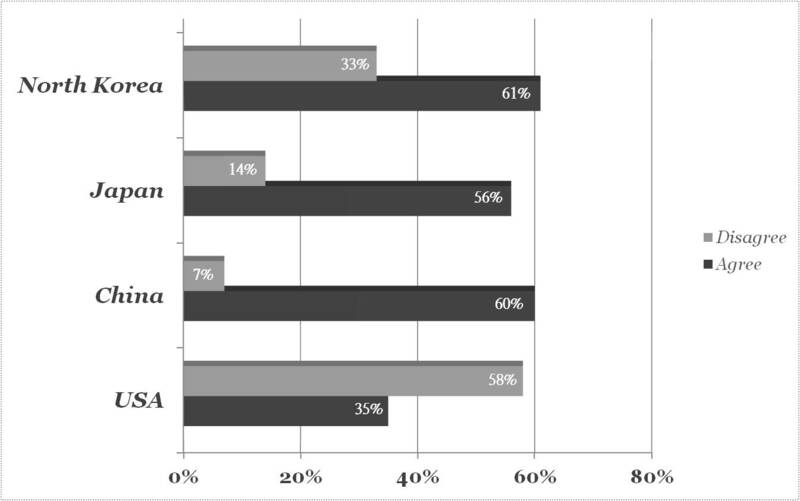 Source: “Summary Analysis of Poll on the Korean-Chinese Summit, Attitudes towards Key Countries, and Minimum Wage Assessment,” July 1-15, 2013. Numbers have been rounded. As its largest trading partner, North Korea’s only ally and primary benefactor, and the world’s rising superpower, China has a flourishing relationship with South Korea, but 18 percent of South Koreans believe that China is the biggest combined threat (higher than Japan with 14%) and second to North Korea (47%).7 South Korea’s democratization and globalization—two key trends that have accelerated since the late 1980s—have contributed to much more stable and favorable perceptions of the United States. 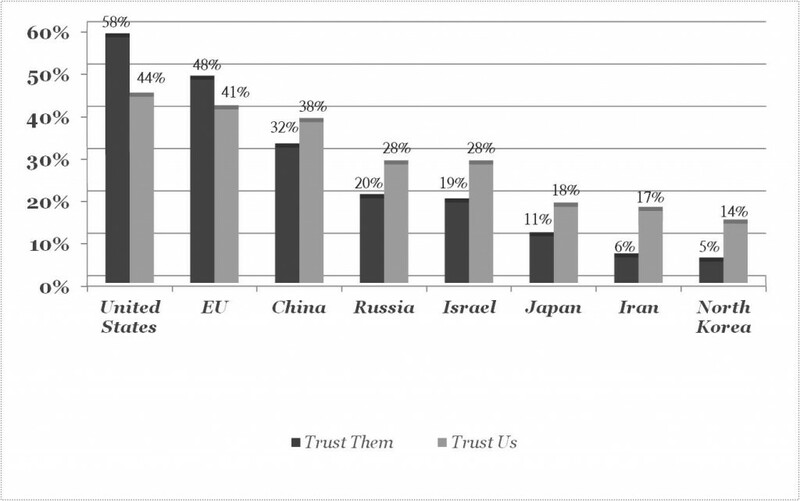 In July 2013, 57.3 percent of South Koreans trusted the United States while only 31.7 percent said they trusted China, followed by Russia with 19.9 percent, Japan with 11.4 percent, and North Korea with 5.6 percent. Source: “Summary of Analysis of Asan Daily Poll on the ROK-U.S. Alliance, Missile Defense, and Views of the Middle Class,” The Asan Institute for Policy Studies, May 16-31, 2013. Koreans are keenly aware of the potential role China is likely to play in reunification, a critical reason for assessing its growing influence on the peninsula. 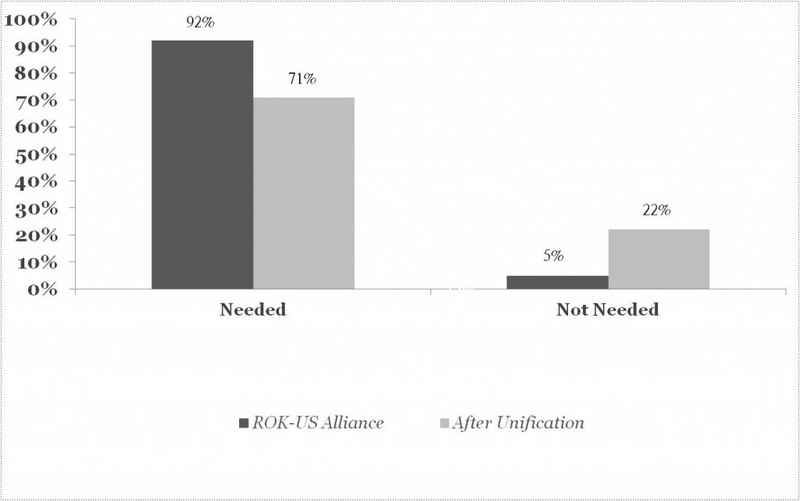 That said, many believe that the ROK-US alliance remains one of the best guarantors of security, as illustrated by the fact that 81.7 percent responded in May 2012 that bilateral relations were positive or very positive.8 With respect to key aspects in the alliance, 42.7 percent replied that the alliance is an important component of the relationship followed by 24.6 percent for the FTA and economic cooperation, and 22.5 percent for scientific, educational, and other areas of cooperation such as climate change.9 As seen in Graph 9, an overwhelming portion of South Koreans feel that the alliance should be maintained after unification. South Korea’s seemingly contradictory worldviews have been analyzed at length since they are a critical prism through which to view strategy towards North Korea. 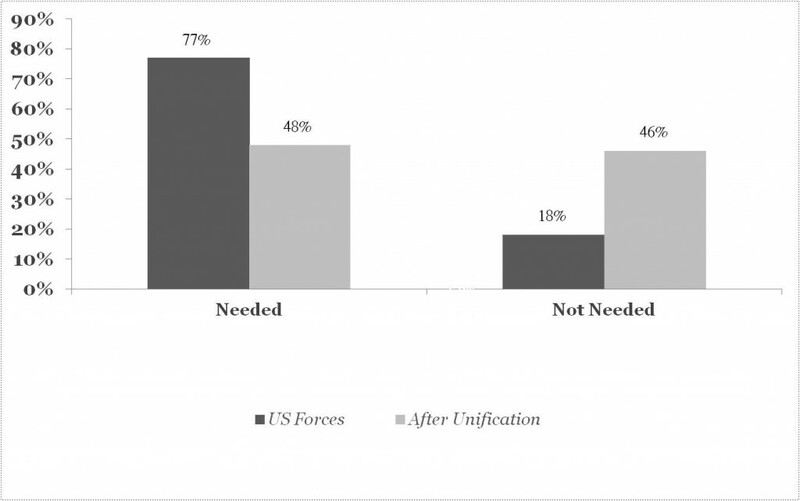 As illustrated in the survey results in Graphs 2, 3, and 4 on perceptions of future threats, the state of current relations with key countries, and prospects for improvements in major bilateral relationships, contrasting results attest to the multifaceted, seemingly contradictory, but also starkly realistic appraisal of its core national interests. For example, 61 percent of South Koreans agreed that North Korea could be seen as a future threat while, at the same time, 46 percent responded that relations with North Korea were likely to improve compared to 36 percent who stated that ties with the North were likely to worsen. A majority feels that it is natural to perceive North Korea as both the major threat and an entity with which one can aspire to improved relations. Unsurprisingly, South Korea’s security priorities are heavily focused on meeting a growing threat from North Korea and prospects for non-linear transformation on the Korean Peninsula, while coping with great power tensions and competition and ensuring economic and energy sustainability for a nation that is overwhelmingly dependent on trade and foreign oil. Since its founding in 1948 but particularly in the aftermath of the Korean War, South Korea’s conceptions of national security and corresponding threats have been shaped by the powerful grip of geopolitics and a security paradigm that focuses on meeting a range of military-dominant threats emanating primarily, although by no means exclusively, from the North. Source: Defense White Paper 2012 (Seoul: Ministry of National Defense, 2012), 306. Although divining North Korea’s intentions is fraught with uncertainty, these actions suggest that Kim Jong-un wanted to brandish his military credentials for domestic political purposes, signal displeasure to China for supporting UN sanctions, and “lock in” North Korea’s status as a nuclear weapons state. Despite ongoing hopes pinned on North Korea’s return to negotiations and a more fundamental belief that Pyongyang can bargain away its nuclear programs at the right price, the North has steadfastly insisted that it has no intention of doing so. On March 16, 2013, the North Korean Foreign Ministry declared, “the US is seriously mistaken if it thinks that the DPRK had access to nukes as a bargaining chip to barter them for what it called economic reward.”13 Since the crisis of spring 2013, North Korea has opted to reopen the Kaesong complex, while initially agreeing to hold the next round of meetings for separated families, which it abruptly cancelled. 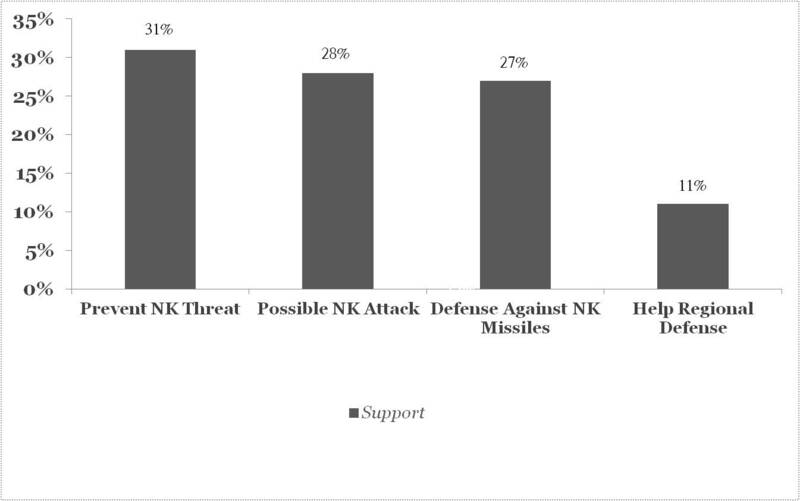 The North Korean threat remains at the top of South Korea’s national security priorities, as the nature of the threat evolved since the early 1990s through the convergence of three main factors: (1) enhanced asymmetrical challenges spurred by its nuclear weapons and ballistic missiles capabilities in addition to the growing threat posed by cyberattacks, (2) the preponderance of conventional and special forces that are still geared towards a blitzkrieg strategy, and (3) the possibility of non-linear scenarios arising from disruptions within North Korea. 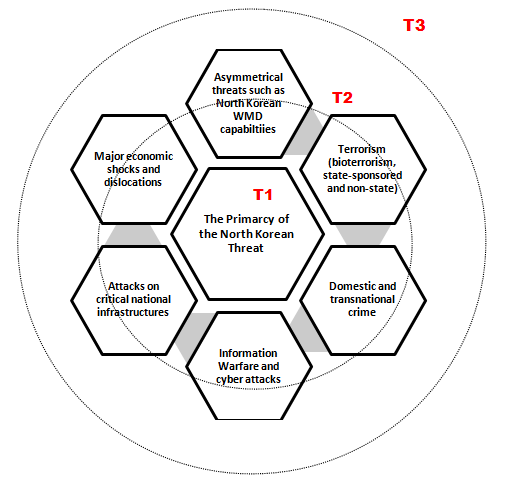 Thus, South Korea is entering into an era that can be best characterized by growing hybrid security threats or the amalgamation of traditional, non-traditional, and emerging security threats, although national security planning, related institutions, and policymaking processes (including national intelligence) continue to be focused heavily on meeting essentially traditional security threats such as North Korea-related contingencies. 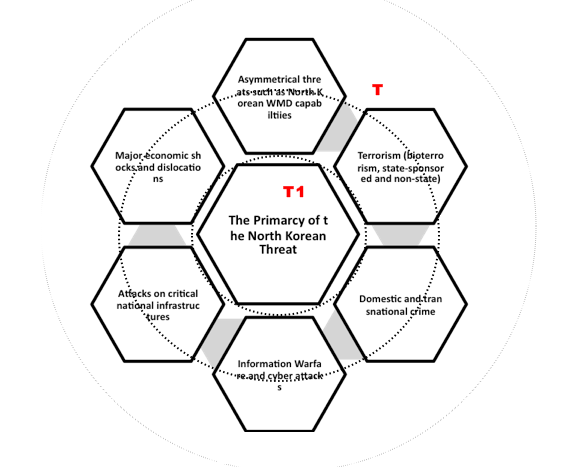 Picture 1 illustrates the emerging national security matrix based on three tiers: Tier 1 (core and urgent national security issues such as the range of threats emanating from the North); tier 2 (important national security concerns that have the possibility of transitioning to tier 1 threats); and tier 3 threats likely to entail long-term, although not necessarily less severe, repercussions. In tandem with a growing spectrum of national security threats, hybrid security threats pose unprecedented pressure, owing to stretched budgetary resources, fairly fixed national intelligence priorities, and a security apparatus that is ill-prepared to cope more effectively. Third, home-grown terrorism could be another source of threat, and some analysts assert that with an increasing influx of foreign workers (including from the Middle East and other Muslim states), one should consider the possibility of networked terrorist attacks with foreign groups. Overall, however, South Korea’s counterterrorism policy continues to place primary weight on preventing potential attacks from the North coupled with attacks on overseas Koreans. As South Korea upgrades its counterterrorism policies in the face of growing asymmetrical threats (such as cyber attacks from the North), it faces major challenges. The National Assembly has yet to pass a comprehensive anti-terrorism bill since the opposition parties argue that the government can abuse its already extensive powers without effective privacy and legal constraints. South Korea is becoming increasingly impatient and concerned after two decades of living under the specter of the North Korean nuclear crisis. While it remains firmly committed to its long-standing non-nuclear posture, as evinced by its membership in the NPT, not to mention other non-proliferation regimes such as the MTCR and PSI, North Korea’s third nuclear test has triggered a new debate on whether it should also consider its own nuclear deterrent, convince the United States to redeploy tactical nuclear missiles in South Korea, or significantly enhance its conventional deterrence assets vis-à-vis North Korea’s accelerating nuclear capabilities. The government remains committed to a non-nuclear posture, given that any move to acquire its own nuclear capabilities will result in key opportunity costs, such as a fundamental setback in the ROK-US alliance, triggering a domino effect in East Asia such as Japan discarding its own non-nuclear posture, and China and Russia reconfiguring their nuclear strategy to take into consideration a nuclearized or potentially nuclearized South Korea. Last but not least, Seoul would lose the moral high ground in sustaining key international cooperation, including the maintenance of sanctions against the North. Nevertheless, if North Korea is able to miniaturize nuclear warheads for ballistic missile delivery it would not only threaten South Korea, but also Japan and the United States. Moreover, despite China’s disapproval of North Korea’s nuclear programs and continuing support for resolving the nuclear problem through multilateral negotiations such as the dormant Six-Party Talks, many are wondering how effective future talks will be when North Korea is determined not to relinquish or dismantle its nuclear capabilities. Thus, even though the vast majority of South Korea’s national security community remains committed to a non-nuclear posture, public patience is running thin with increasing demands for more robust responses to North Korea’s mounting nuclear threats. Maintaining South Korea’s firm non-nuclear posture while upgrading Seoul’s ability to launch credible preemptive strikes against the North, if warranted, looms as a major strategic task for the Park administration. For the United States and China, a nuclearized North Korea remains the most important security challenge on the peninsula, but the challenge is by no means solely limited to nuclear and ballistic missile threats. If North Korea is unwilling to give up its nuclear arsenal, it is time for Beijing to fundamentally reassess its alliance with Pyongyang. While it is difficult to imagine any abrupt shift in these ties, a key foreign policy question for President Xi Jinping is whether North Korea is no longer a strategic asset but a strategic liability for China’s own core interests. Should China continue to render virtually unending support for the North, the result will be unintended consequences, such as accelerating Japan’s ongoing rightward shift and its development of more credible power projection capabilities. To be sure, Japan’s core security perceptions are also influenced by what it perceives as the long-term threat of China’s increasingly robust military presence and capabilities. Nevertheless, China may begin the process of rethinking its strategic interests on the peninsula, including the longer term benefits that could arise from a unified Korea that is democratic, with a vigorous market economy, fully linked with the global community. Such a Korea would entail a different security makeup including a significantly reduced US military presence; so that continued, key security and economic ties with the United States would not pose a threat to China’s strategic interests. From Washington’s perspective, a nuclearized North Korea together with a potentially nuclearized Iran and the possibility of protracted instability in a nuclearized Pakistan stand out as some of the most pressing challenges to US and international security. While it should continue to emphasize the negotiation track vis-à-vis North Korea even as it bolsters South Korea’s defenses, it should also work closely with Seoul and Beijing in beginning the process of re-engineering the “Korean question.” No one really believes that the North Korean nuclear conundrum can be resolved any time in the near future, while efforts should continue to restart the Six-Party Talks. Whether these talks ultimately will bear fruit remains unclear, although they are the only multilateral mechanism specifically designed for North Korea’s denuclearization. In the aftermath of the North’s nuclear tests amid growing concern that it is succeeding in miniaturizing nuclear warheads, we may be seeing the declining utility of diplomatic initiatives. If North Koreans are able to produce critical components of nuclear weapons, as indicated by evidence that they have “set out to master, and perhaps have mastered, domestic production of crucial centrifuge-related components and technologies,”21 sanctions such as export controls may become decreasingly effective. All of the parties to the Six-Party Talks, especially China, have to realize that North Korea may never yield to political pressures. The Obama administration has to place greater weight on designing a new approach towards the peninsula together with China and the active participation of South Korea even as efforts continue to jump-start the Six-Party Talks. China, more than ever, has to realize that if North Korea proceeds with a robust nuclear weapons program and Beijing doesn’t exert real pressures on Pyongyang, it will result in increasingly negative repercussions for China’s own strategic interests, quite apart from eroding stability on the Korean Peninsula and Northeast Asia. The North Korean nuclear crisis has also brought to the fore the issue of proceeding with or postponing indefinitely the planned transfer of full wartime operational control to South Korea by December 2015. Proponents of the transfer argue that ROK forces must begin to assume the leading role in South Korea’s defense with matching defense upgrades, whereas opponents maintain that in the face of a growing North Korean nuclear threat, the current Combined Forces Command is the optimal model for maintaining an effective deterrence posture. The Park administration should proceed with the current timeline, but only after it completes key interim assessments and with the full support of the defense establishment in Seoul and Washington. 1.“Summary Analysis of Asan Daily Poll on National Security, Assessment of Relations with the Neighboring Countries, and Accountability over the Breakdown in South-North Negotiations,” The Asan Institute for Policy Studies, June 1-30, 2013, 8. 2. “Japanese Public’s Mood Rebounding, Abe Highly Popular,” Pew Research Global Attitudes Project, Survey Report, July 11, 2013, >http://www.pewglobal.org/2013/07/11/japanese-publics-mood-rebounding-abe-strongly-popular/. 3. “America’s Global Image Remains More Positive Than China’s,” Pew Research Global Attitudes Project, Survey Overview, July 18, 2013, >http://www.pewglobal.org/2013/07/18/americas-global-image-remains-more-positive-than-chinas/. 5.International Trends: Korea 2012 Partners, The Asan Institute for Policy Studies and The German Marshall Fund of the United States, 2012, 5. 7. “Summary Analysis of Poll on the Korean-Chinese Summit, Attitudes towards Key Countries, and Minimum Wage Assessment,” July 1-15, 2013. 8. 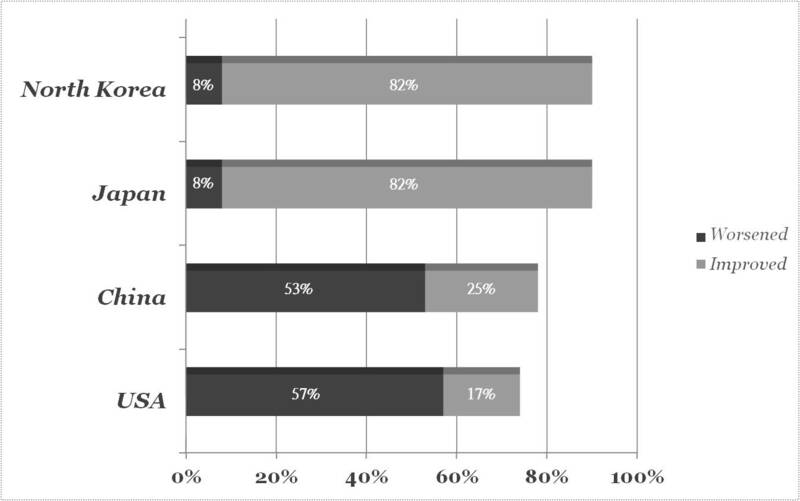 “Summary of Analysis of Asan Daily Poll on the ROK-U.S. Alliance, Missile Defense, and Views of the Middle Class,” The Asan Institute for Policy Studies, May 16-31, 2013. 9. 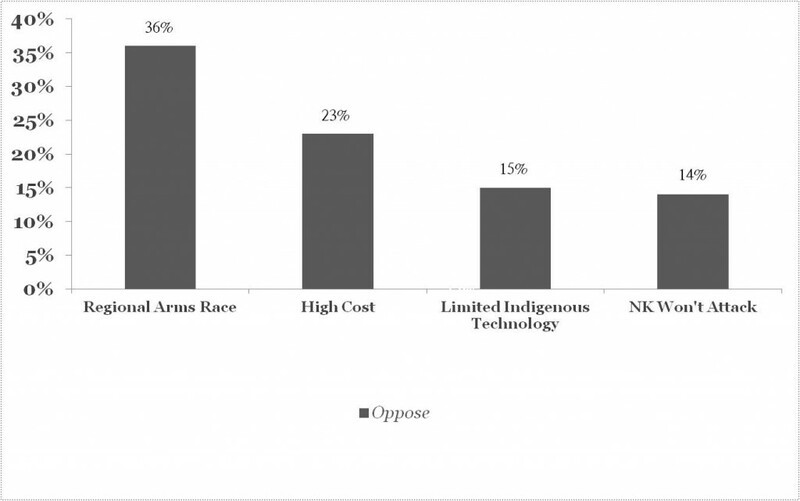 “Summary of Analysis of Asan Daily Poll on the ROK-U.S. Alliance, Missile Defense, and Views of the Middle Class,” The Asan Institute for Policy Studies, May 16-31, 2013. 10. Kukbang baekso 2012 (Seoul: Ministry of National Defense, 2012), 306. 11. Simon Mundy, “Kim Rides High After Missile Launch,” Financial Times, December 13, 2012, >http://www.ft.com/intl/cms/s/0/44a9eac4-44f3-11e2-858f-00144feabdc0.html#axzz2NqYZUiRc. 12. Rick Gladstone and David E. Sanger, “Tougher Sanctions on North Korea Pass in Unified U.N. Vote,” The New York Times, March 7, 2013, >http://www.nytimes.com/2013/03/08/world/asia/north-korea-warns-of-pre-emptive-nuclear-attack.html?emc=eta1&pagewanted=print. 13. Quoted in Kwanwoo Jun, “North Korea Says Nuclear Weapons Not a Bargaining Chip,” The Wall Street Journal, March 17, 2013. 14. Choi Jin Tae, “Kukjae kyoru hwakdaeae tareun kukne taeroweehyeop hwangyungeui byunhwa,” Journal of Counterterrorism, no. 7 (January 2010): 119. 15. Choe Sang-Hun, “Afghan Hostage Crisis Transfixes South Korea,” The New York Times, July 26, 2007, >http://www.nytimes.com/2007/07/26/world/asia/26iht-korea.4.6849627.html?pagewanted=all. 16. Kim Seon Ju, “Saebeo beom jwae geom geo ryul 3nyun yeonseok harak,” Hankyung, October 2, 2012, >http://www.hankyung.co m/news/app/newsview.php?aid=201210021525i. 17. Chang Hye Jin, “Jooyo jeonsanmang jangae ilji,” Yonhap News, March 20, 2013, >http://news.naver.com/main/hotissue/read.nhn?mid=hot&sid1=102&cid=935766&iid=618992&oid=001&aid=0006157459&ptype=011. 18. Nicole Perlroth and David E. Sanger, “Cyberattacks Seem Meant to Destroy, Not Just Disrupt,” The New York Times, March 28, 2013, >http://www.nytimes.com/2013/03/29/technology/corporate-cyberattackers-possibly-state-backed-now-seek-to-destroy-data.html?emc=eta1. 20. “North Korea ‘Has Technology to Build Uranium-Based Nuclear Bombs,’” The Guardian, September 24, 2013, >http://www.theguardian.com/world/2013/sep/24/north-korea-uranium-based-nuclear-bombs. 21. Joshua Pollack, “North Korean Flow-Forming Lathes,” Arms Control Wonk, September 23, 2013, >http://pollack.armscontrolwonk.com/archive/4026/north-korean-flow-forming-lathes. 22. For an earlier version of South Korea’s increasingly complex foreign policy hurdles, see Chung Min Lee “The Park Geun-hye Administration’s Foreign and Security Policy Challenges,” Korea Chair Platform, Center for Strategic and International Studies, May 1, 2013, >http://csis.org/publication/park-geun-hye-administrations-foreign-and-security-policy-challenges.